Catalogue of Organisms: In a bunch, in a bunch! 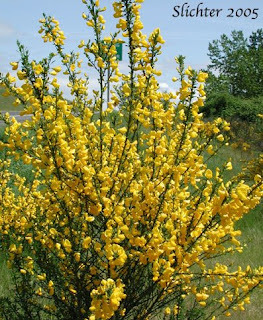 Cytisus scoparius, a widespread broom species, and the most widespread as an invasive species. Photo by Paul Slichter. After the dummy-spit of the last post, let's get on to something a little more comforting. This is, I think, the perfect time for a botany post to calm the nerves. Which is lucky, because the Taxon of the Week post this week is on Genisteae. 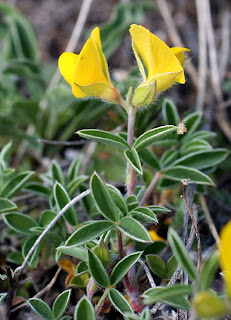 Genisteae is the tribe of about 450 species of mostly Holarctic leguminous plants that includes brooms*, gorse and lupins**. The first of these are the Palaearctic brooms - in an earlier post, I wrote about the New Zealand brooms, which belong to a different legume tribe, the Galegeae, and whose broom-like appearance is convergent with that of the Genisteae brooms. However, a number of species of Genisteae have been transported by humans to many temperate regions around the world (including New Zealand), and many are familiar weed species outside their native ranges. *The shrubs, obviously, not the things you sweep with. Though brooms the plants were often used for the making of brooms the implements, which is probably the origin of the name of one or the other. **Monty Python fans are permitted to start humming now. Argyrolobium zanonii, a Mediterranean species of the possibly polyphyletic genus Argyrolobium that is one of best contenders for inclusion in the Genisteae. Photo from here. Phylogenetically, Genisteae can be divided into three well-divided groups (Ainouche et al., 2003). The probably paraphyletic Argyrolobium group includes five genera of mostly southern African and South American plants that lie outside the clade formed by the Palaearctic members of Genisteae. Previously members of this group were included in the sister tribe Crotalarieae, and their position remains unsettled. 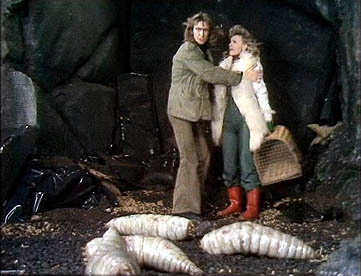 In particular, it has been suggested that Argyrolobium itself may be polyphyletic, with some species belonging to Crotalarieae and others to Genisteae. With the Argyrolobium group included, the Genisteae are characterised by a basically two-lipped calyx with a trifid lower lip, and the presence of quinolizidine alkaloids of a-pyridone type (chemical characters have proven to be very useful in plant systematics, with many groups characterised by the production of particular secondary metabolites). Lupinus polyphyllus, a lupin species native to western North America. Photo from Wikimedia. The genus Lupinus (the lupins) form a distinct group from the remainder of the Palaearctic Genisteae. Lupinus is by far the largest genus of Genisteae, including about half the species and the only genus to have made it to the New World, where it is found in both North and South America. Most lupins are readily distinguished from other Genisteae by their palmate, divided leaves. While the flowers are not particularly edible (despite the rumoured possibilities of lupin soup, roast lupin, steamed lupin, braised lupin in lupin sauce, lupin in the basket with sauted lupins, lupin meringue pie, lupin sorbet...), the beans of some species are eaten pickled (raw beans generally contain toxic alkaloids) in Mediterranean areas or Latin America. 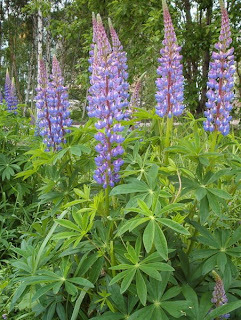 Lupins have been widely grown as stock feed and as ornamentals, and include many of the aforementioned weed species. 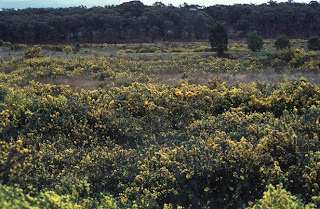 Valley in Victoria (Australia) overrun by the vile Ulex europaeus. Photo by Kate Blood. The remaining genera of Genisteae form the subtribe Genistinae. Diversity of Genistinae is centred around the Mediterranean, with the three best-known genera being the brooms in Genista and Cytisus, and gorse in Ulex (Ulex and the closely related, possibly synonymous, genus Stauracanthus have been placed in a separate subtribe Ulicinae, but Ainouche et al., 2003, demonstrated that these genera fell within Genistinae). A number of other broom genera are recognised, but classifications may differ on which genera are recognised as including which species. The Genistinae also includes the tree genus Laburnum (Käss & Wink, 1997). Members of the Genistinae are characterised by adaptations for arid habitats such as very small or absent leaves and photosynthetic stems. Ulex species have the leaves modified into long spines. The species Ulex europaeus (commonly called simply "gorse") was introduced into New Zealand for use in hedges, a role which it apparently fulfils admirably in Britain. Unfortunately, the imported gorse plants found the New Zealand climate much more to their liking than that of their native Britain, and are currently one of New Zealand's most widespread and visible weed species. Yours truly has many unwelcome memories of hot summer days spent grubbing up gorse plants. Ainouche, A., R. J. Bayer, P. Cubas & M.-T. Misset. 2003. Phylogenetic relationships within tribe Genisteae (Papilionoideae) with special reference to genus Ulex. 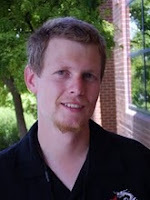 In Advances in Legume Systematics part 10, Higher Level Systematics (B. B. Klitgaard & A. Bruneau, eds.) pp. 239-252. Royal Botanic Gardens: Kew. Käss, E., & M. Wink. 1997. Phylogenetic relationships in the Papilionoideae (family Leguminosae) based on nucleotide sequences of cpDNA (rbcL) and ncDNA (ITS 1 and 2). Molecular Phylogenetics and Evolution 8 (1): 65-88.